If you still think eating butter will make you fat, you need to read this! Are you the one cutting back on all sources of fat from your diet? Do you have your toast without butter or replace it with margarine? Do you pick up items from the grocery aisle that says Fat-free? Lets go back to basics: Do you remember your school biology lessons? Vitamins can be classified into 2 main types. It determines how each vitamin acts within the body. Fat soluble vitamins. What does that mean? It means Vitamin A, D, E and K will be absorbed in presence of fat. So to dissect it further, how can a fat soluble vitamin be absorbed if we consume everything fat free. If fat intake of a person is too low, he or she can become deficient in fat soluble vitamins i.e. A, D, E and K. Does that make sense? 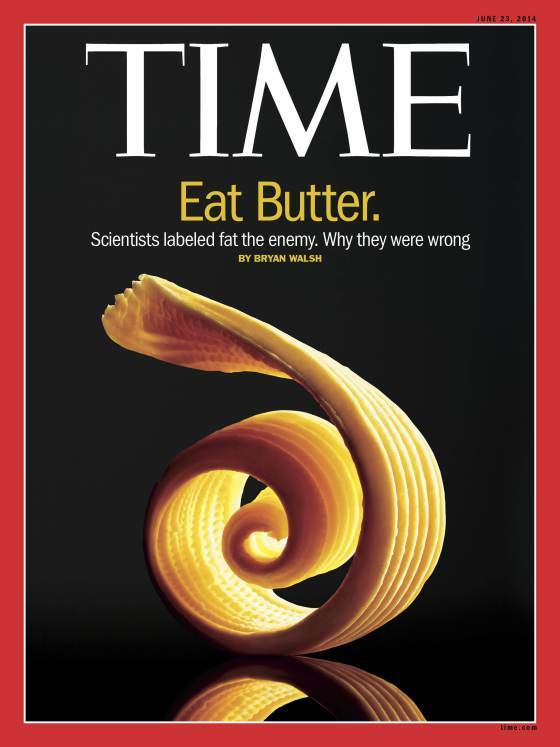 The new health buzz says eat more butter/fat. Understand and comprehend why this shift? Saturated fat: is solid at room temperature. It is found in animal products such as milk, cheese, butter, meat and oils like coconut oil, palm oil and cocoa butter. Unsaturated fat: is liquid at room temperature. It is found mainly in oils from plants. Polyunsaturated fats can further be classified as Omega-3 and Omega-6 fatty acids. Trans fat: Most of the trans fat we come across is created by an industrial process that adds hydrogen to liquid vegetable oils to make them more solid.The process is called hydrogenation. This process increases the shelf life of fat and makes the fat harder at room temperature. Harder fat makes crispier crackers and flakier pie crusts. The dietary source for trans fats are processed foods, chips, crackers, cookies, salad dressings, margarine etc. Small amounts of trans fats occur naturally in some meat and dairy products but its effect is not fully studied. In short: yes, most of the trans fat is man-made and is bad! Both saturated and unsaturated fat occurs naturally and is not as bad as pictured for decades! Fat is not the villain! Fats are concentrated source of energy. Our body turns to fat as a backup energy source when carbs are not available. Fats help in the absorption of fat-soluble vitamins A, D, E and K. Fat cells insulate our body and help sustain a normal core body temperature. Fat is not bad by itself! It is the kind of fat (poor quality, loaded with hormones, trans fat) that we are consuming is bad! Something to think about and oppose: Kids were and are still given low fat milk in schools as a healthy choice. But drinking low-fat milk leaves kids feeling hungry, leading them to eat more—usually carbs and junk making them fat. Fat cannot disappear in thin air. So we made fat replacers with artificial ingredient to make it fat-free or low-fat. Neither skim milk, margarine, non-fat ranch nor low-fat oatmeal has made us healthy as they were supposed to. More than third of US is obese. To make matters worse all the artificial ingredients are messing our systems and leaving us with chronic health problems which we have to deal with.